What is Burmese Traditional Coconut Chicken Khow Suey? 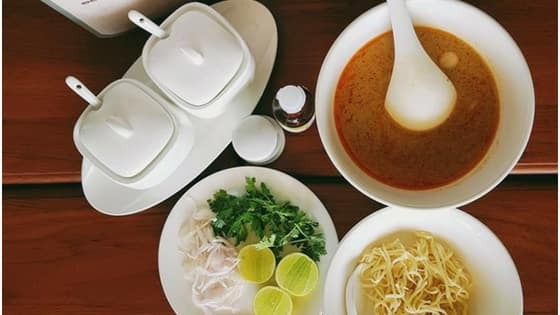 Burmese traditional coconut chicken Khow Suey also known as Ohn Noh Khow Suey is one of the tourists’ favorite Burmese food because this delicious coconut noodle-soup doesn’t have strong unfamiliar-taste. It is one of the most popular breakfast in Myanmar and most of the locals love to eat it. Since this is the coconut noodle soup, you might think this soup is going to be too sweet. No, friend! It has quite a unique and special taste that you might want to eat again and again. 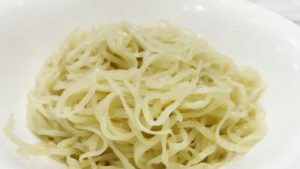 There are many different versions of Coconut Khow Suey and the classical Burmese Coconut Chicken Khow Suey is the best. The typical coconut noodle soup is always cooked with chicken and coconut milk. The taste is totally different when the noodle-soup is cooked with milk and not as heavy as the typical one. It is a pleasant feeling to chew the chicken bones while eating Ohn Noh-Khow Suey. Only wheat noodles are used to eat with the spiced chicken coconut broth. There are two separate part of cooking when preparing the classical Burmese coconut Khow Suey. Firstly, you need to marinate the chicken with turmeric, chili-powder, fish-sauce, salt, chicken powder, and a little bit of sugar. After marinating the chicken for about 20-30 minutes, mix the chicken with onion-chops, ginger-chops, and garlic-chops to cook. When the chicken curry is ready, put it aside and continue to cook the coconut broth. In order to make the soup, they need to boil the split peas until very soft and tender. When the peas are ready, take it out and squash it into the thick paste. After that, you need to boil the chicken-stock in a saucepan with some water, and then add the thick pea-paste. When the chicken is well cooked and the mixture is well seasoned, add the coconut milk. You can either use ready-made coconut milk or hand-made coconut milk but the hand-made coconut milk has better taste. After cooking for about 15 minutes, you will get the perfect typical Burmese coconut noodle soup. Firstly, put one or two spoons of chicken curry into the bowl. Then, add the noodles, then add some onion rings, and pour the soup on top. You can add some lime juice and chili powder into the soup in order to make it taste better. Now you may enjoy the tasty traditional Burmese Coconut Khow Suey!